Over the past month, I’ve been collecting a few (hopefully useful) tips and I’ve come across some intriguing little tidbits of news – none of which are worth a full blog post but all of which I thought might be of interest to you, and I decided that this format would be a good way to share them. Please note that this post is not sponsored in any way. I’m not affiliated with, recommending or receiving payment from any of the companies or organizations mentioned. I’m just sharing what I consider to be delightful or useful bits of news with you – you know, the kind of stuff you might talk about when you get in a discussion about camping with your friends around a campfire. First, the tips . . . I would venture a guess and say that not only do most camping enthusiasts develop their own personal methods for packing and unpacking, setting up and breaking camp, and prepping food and cooking meals, but they also try to find the most efficient ways of handling these camp chores and others, so a good tip is always appreciated. Below are a few particular things that Alan and I have found useful so I thought I’d share them with you. If these tips are already in use at your campsite, give yourself a pat on the back and be sure to pass them along to another fellow traveler. You don’t have to microwave quick oats or cook them on the stove to enjoy a hot breakfast. I eat oatmeal almost every day, so a container of quick oats is usually in the pantry of our travel trailer. Directions are given for cooking them on the stove or in the microwave, but we’re often camping without hookups so no microwave unless we’re running the generator which we try to do as little as possible. And, if I cook the quick oats on the stove, then I have a pan to wash. Normally, that isn’t a big deal, but we’re usually up and out early when we’re traveling so, if I can eliminate anything that gets in the way of us getting out and/or into whatever park we’re in or near, then I’m all for it. I found out that, if I heat water in a pan or teapot on the stove to boiling and simply pour it over my quick oats right in the bowl, my oatmeal will be warm and ready to eat in just a couple of minutes. (Make it even tastier with a little brown sugar, lots of fresh fruit and a sprinkling of cinnamon. Yum!) I just leave the pan or teapot to air dry when I’m done. No muss, no fuss – just the way I like it! This method does work for regular oats, too, but I don’t enjoy them this way as much as I do the quick oats. I think I’d stick to cooking regular and steel cut oats the traditional way. I know that some people set a bowl of oatmeal with milk or water in the refrigerator overnight so that breakfast is ready when they get up, but that’s too reminiscent of milk over cold (and soggy) cereal and you may recall how I feel about that . . . Eeeew! Checklists make life easier. On our computer at home, we have a checklist for packing, a checklist for breaking camp and a checklist of things to do before we leave home which I print out and we work through when we’re getting ready to head out on a camping adventure. Those of you who can remember everything without writing it down have my undying admiration. My mind just doesn’t work like that. I like lists and I like to check things off my lists. It gives me a feeling of accomplishment plus it allows me to leave (home or campsite) relaxed and at ease, rather than worrying about whether or not something was packed, done or put away. Those of you who recall that I’m very detail-oriented will not be surprised by this: Our checklists total five pages (yes, I said five) and include individual packing lists of personal stuff for Alan and me. Before you laugh at me, let me tell you that we’ve never left anything behind at a campsite, we don’t have to make emergency stops at grocery or department stores for forgotten items and we’ve NEVER lost our awning which, unfortunately, can’t be said for the guy my brother-in-law, Tom, saw leaving a campground a number of years back. I guess it was nobody’s job to be sure the awning was in and the first trees he came to ensured that he wouldn’t have to worry about it for the rest of that trip. See what happens when you don’t have a checklist? If you buy some type of salad in a recyclable plastic tub without a lid, don’t throw the containers away! I often buy a one pound container of spring mix from Sam’s Club for use at home and we found that a clean, empty container is perfect for storing some of our bulkier items in the cabinets of the travel trailer. One holds our dollar store umbrellas and rain ponchos, another holds the extra wires for something or other on the entertainment unit as well as the remote. The items are easily accessed but corralled, and anything that makes it easier to keep our RV neat and well organized is a beautiful thing in my book. They’re also the perfect size for some smaller grocery items that we don’t want rolling around by themselves on pantry shelves and, I imagine, they’d be helpful for keeping toiletries or small toys and games together (depending on your storage set up). Plus, I’m pretty sure they’re stackable, so it would be easy to carry a few empty ones simply by setting them under one already in use. And, they’re free! Well, in a way. My frugal heart likes that! But, listen, if you do buy them but you’re not going to use the empties, please do recycle them! Bandanas are cool. No, really! They come in handy when temps are high but you want to be out and about adventuring. We always keep a few in the RV for that very reason. Just wet a bandana and tie it around your neck. As the water evaporates off your skin, it will help keep you cool. Plus, running a damp bandana over your hot, sweaty face will do wonders for your body and your disposition. Your bandana can be refreshed at restroom sinks, water fountains or even lakes and streams, if necessary. A cheap cotton bandana from the dollar store or Walmart will do the trick. You can even buy some to match your outfits, if you’d like. Pencil boxes are the BEST! Have you seen those small plastic pencil boxes that are quite popular during back-to-school shopping days? They’re absolutely perfect for packing phone chargers, office supplies, over-the-counter or prescription medications and first aid supplies. We actually filled two of them with first aid supplies when the kids were young since one of the kids (looking at you here, my darling daughter!) went through gauze and band-aids really fast. I like the fact, too, that we can grab the first aid kit and throw it right in a backpack if we’re heading out for the day. In the drawer with our owner’s manuals and other paperwork, we keep a pencil box filled with pens, pencils, notepads, paper clips, glue – and even a tiny stapler. (We call it "the office," as in, "Scissors? They're in the office.") Using the pencil boxes instead of scattering any of these items on a shelf or in a drawer helps keep all of our stuff a little better organized. Plus, because they're usually a standard size, they stack well. And, guess what! Back-to-school supplies are already making their appearance so, if you want to buy a few, these pencil boxes should be readily available and fairly inexpensive right now at just about any store in your neighborhood. It sounds yummy – if you like S’mores. So, that’s it for the camping tips, now here are some tidbits I rounded up . . .
An old photo - the new KOA signage is much more upscale! 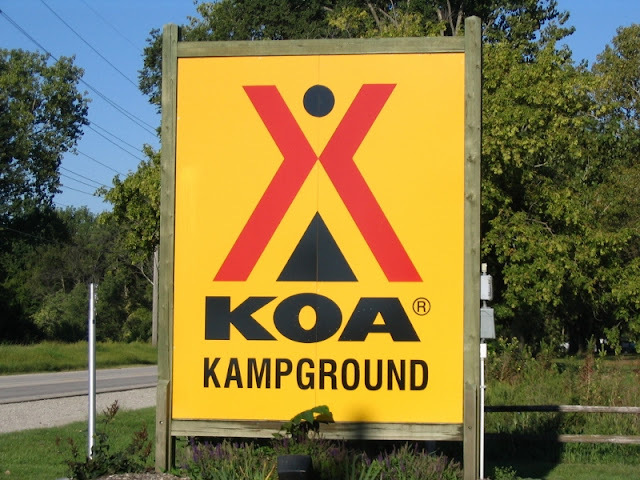 KOA is now offering RV sites with patios at some of its locations. Trademarked as “KOA Patio Sites,” these roomy (250+ square feet) sites have a patio with two furnished outdoor seating areas and a fire pit - a private patio space in which you can relax and comfortably enjoy being outdoors. 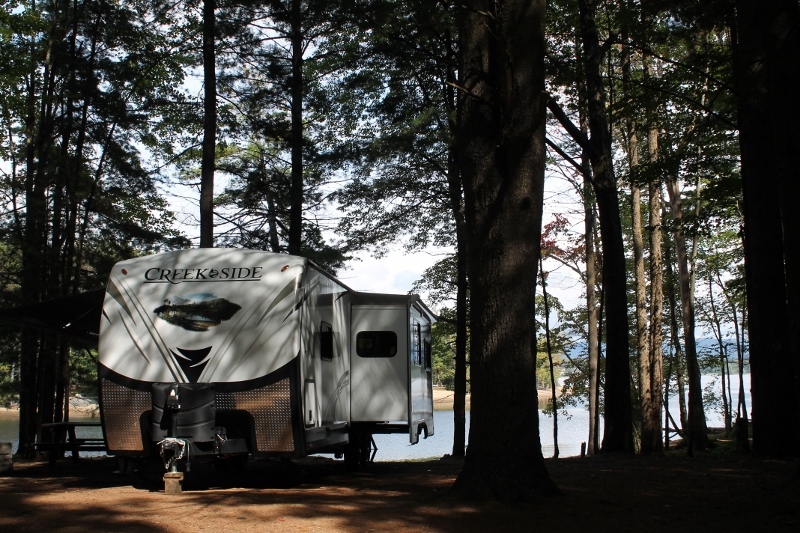 Patio Sites are also available at some KOA locations for tent sites or cabins. Want to check them out? Link HERE. The 2018-2019 Arizona RV and Camping Guide is now available! I know Arizona is a favorite destination of many camping enthusiasts, especially during the cold winter months. The Arizona Association of RV Parks and Campgrounds announced that the new 2018-2019 guide can be ordered by visiting the organization’s travel planning web site, Go Camping in Arizona, and clicking on "Directory Request" at the top of the home page (link HERE). The Arizona RV and Camping Guide contains a fold-out travel planning map that pinpoints the locations of more than 90 campgrounds, RV parks and resorts across the state, and it contains detailed descriptions of each park. You probably all know that I would favor Arizona’s State and National Parks over private campgrounds, but I realize that not everyone prefers camping on our public lands. As I always say, to each his own – just get out there and enjoy the great outdoors no matter where you camp! Gander Outdoors plans to sell RVs. I don’t know whether or not you remember reading this in the news but, a little more than a year ago, Camping World Holdings, Inc. (CWHI), which is the parent company of both Camping World and Good Sam, purchased the assets of Gander Mountain (outdoor outfitters) and Overton’s (boating equipment and supplies). The company has been busy re-branding (and re-opening) some Gander Mountain locations into Gander Outdoors and taking over the in-store and online operations at Overton’s. In addition, CWHI has been expanding the number of Camping World locations, as well. Now the company has announced that it is planning to offer RV sales at 40 of its Gander Outdoors locations by next spring. Interesting. Seems like everybody is jumping on the RV Sales Bandwagon. Hey, people, you do know that your Good Sam card will earn you a discount at both Gander Outdoors and Overton’s, don’t you?! Getting our kicks . . .
Route 66 is a musical highway! I can’t believe I researched Historic Route 66 for our 3rd cross country National Parks camping trip (Summer 2017) and never came up with this gem. There is a portion of Route 66 in New Mexico – between Albuquerque and Tijeras – that is really quite unique. 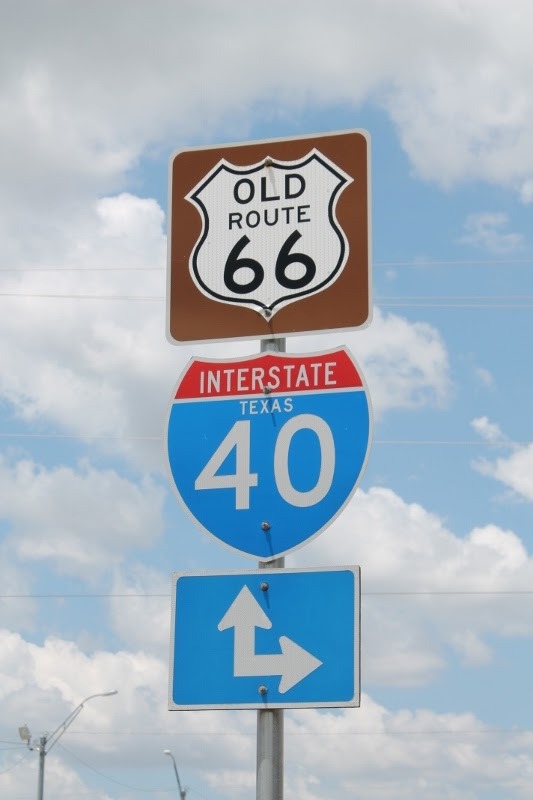 Several years ago, the New Mexico Department of Transportation undertook a major project to bring a particularly desolate section of Historic Route 66 back to life. Grooves were placed near the edge of the road along a one quarter mile stretch of the highway. If you drive over the grooves at the speed limit of 45 mph, you can hear America the Beautiful through the vibrations. Amazing! Am I the only Route 66 fan who didn’t know this?! If it intrigues you like it intrigued me, then cruise on over to the article on the Popular Mechanics web site that explains this entire project (link HERE). And be sure to watch the second video – it’s fascinating! This discovery, of course, means that we’ll be returning to Route 66 in New Mexico at some point in the future. Why? Because I just added this to my Bucket List! Well, that concludes this edition of Tidbits. I hope you found something new, something you liked, something surprising or something fun. (If you have a camping tip you'd like to share, feel free to do so in the comment section below.) Please do come back and visit again soon because you never know what we’ll be talking about here at Reflections Around the Campfire! Love this post. I'm at work and people are looking at me because I keep chuckling to myself. You are dangerous! You should do one of these roundups regularly. It's a goldmine! Well, I'm so happy I could bring a chuckle or two to your day, Ladona! It's amazing how many bits and pieces of intriguing information you run across when you're poking around online! Right now, we're only camping two weeks at a time. For ease (and because I'm always looking for the quickest way) we use duffle bags, placed inside the cabinets to store our stuff. Hubby get a duffle bag for all his clothes. I get a duffle bag for all my clothes. The bathroom gets a duffle bag to store all the bathroom necessities. And a duffle bag containing the necessary food items for our trip goes into the cabinet above the kitchen sink. We live out of the duffle bags. When the trip is over, I simply remove the duffle bags and voila'....our RV is neat and pretty and ready for the next trip. Practically no clean up. I like that idea, Cindi! We're in a similar situation because we don't full time so, although we do leave some items in the RV for the full camping season, we're often loading and unloading food and clothing throughout the year. "Practically no clean up." Love those words!